Blue Ivy Carter flexes her rapping skills on dad's new album. Blue Ivy Carter is her father's daughter. A week ago, Jay-Z released his highly anticipated 13th studio album, "4:44," on Tidal. A physical edition of the album, out July 7, includes three bonus songs: "Adnis," "Blue's Freestyle/We Family" and "MaNyfaCedGod," all of which were first heard in the visual teasers for the album. But the internet is buzzing over "Blue's Freestyle/We Family," which lets Jay-Z's daughter shine. Blue raps for 45 seconds, saying, "Everything, everything is my only single thing / Everything I hear is my answer...I never hear that / I be in the posse / Never seen a ceiling in my whole life." Some lyrics are hard to decipher--she's only 5 years old, after all--but she's clear in the freestyle refrain: "Boom shakalaka / Boom shakalaka / Everything in shaka / Everything in faka." 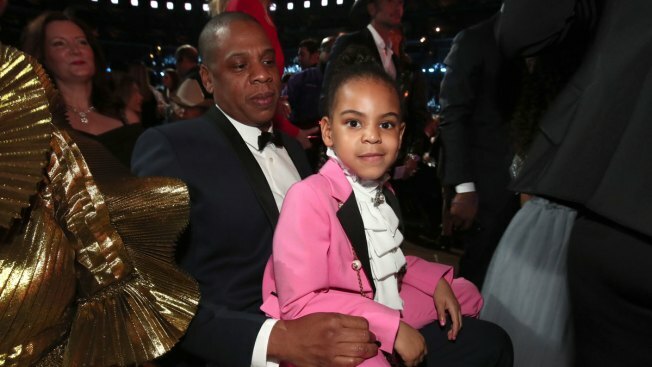 "Blue's Freestyle/We Family" isn't the first time a Jay-Z song has featured his daughter; Blue made her musical debut in his 2012 "Glory," and she was in Beyonce's 2014 song "Blue." The Tidal edition of "4:44" features 10 original songs. Since its release, the album has been certified platinum. "Props to Jay! He's done it again!" RIAA Chairman and CEO Cary Sherman said in a statement Wednesday. "Another platinum album adds to an already iconic career." If you want to hear the album there are now more options open to non Tidal subscribers. A week after releasing his new album on his streaming service, Tidal, Jay-Z has made "4:44" available on iTunes, Apple Music and Amazon Music. "4:44" has yet to appear on Spotify or Pandora. The Recording Industry Association of America announced Wednesday that "4:44" had reached platinum status based off streams and downloads given to Sprint users by the phone company. (Sprint bought a 33 percent stake in Tidal earlier this year.) RIAA's platinum certification was once the equivalent of selling a million albums but has changed since the company began incorporating streaming from YouTube, Spotify and other digital music services. "4:44" includes personal songs about Jay-Z's marriage with Beyonce and his life as an entrepreneur.